This is a Wonderful porcelain lidded pot / bowl , designed by Hans Theo Baumann for Rosenthal Studio Linie, Germany circa 1960’s. The decor is by the renowned Swiss artist and designer Hans Theo Baumann who designed for Rosenthal from 1954 until the 1970’s. The body is semi matte black to the exterior and glossy white inside, circular with deep straight sides. 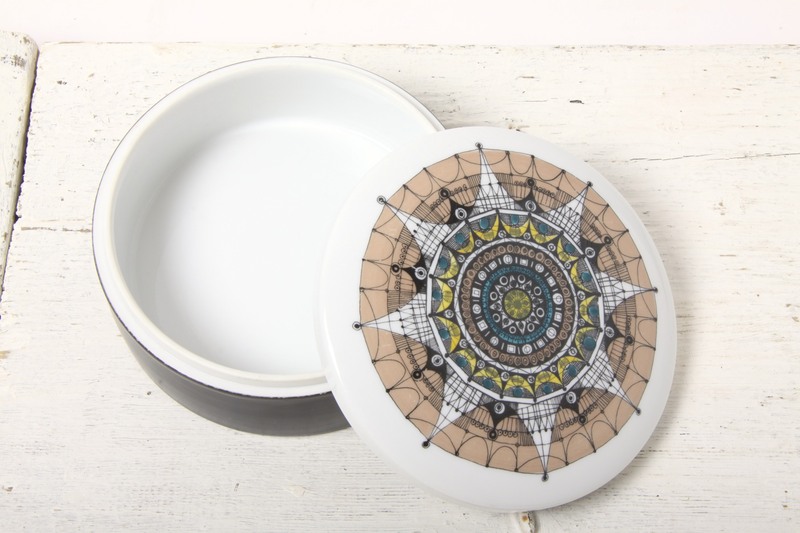 The lid is beautifully soft and rounded, also in glossy white with an intricate abstract / modernist / architectural graphic motif. Resembling a pen line drawing filled in with beige, yellow and green tones. 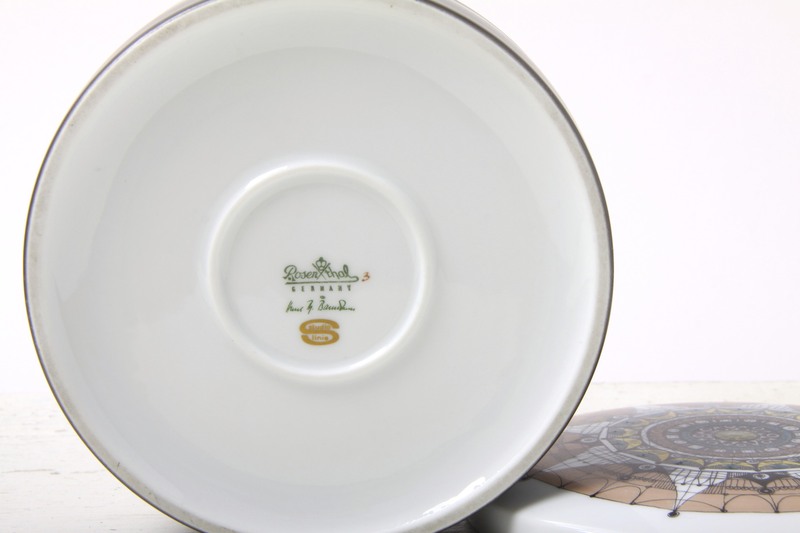 Very stylish and so reminiscent of the era, stunning high quality from this esteemed German company. 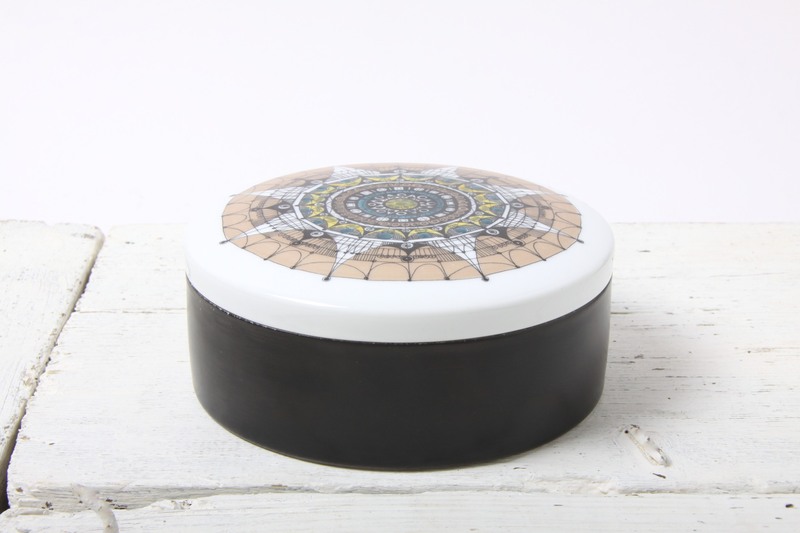 Perfect for a myriad of uses on a dressing table or desk, sideboard or table. Would make a Great addition to any collection of Rosenthal / German or European pottery, and would complement any retro, vintage, mid century, minimal or contemporary interior. Measures 14 x 14 x 5.5cm / 5.5 x 5.5 x 2.25in. Fully marked to the base, with the Rosenthal and Studio Linie logos, artists signature and the form / decor number. In Great Condition, no chips or cracks, a little light wear to the black glaze commensurate with age, nothing to detract on display. Also some very small scratches in the motif on the top, very hard to notice and also do not detract on display.